Ella Wagner passes the baton to Rachel Wahl in the 4x800 relay. The Indian Lake boys varsity track and field team won a home tri-meet versus Ada and USV on March 26. Team scores were Indian Lake 98, Ada 61 and USV 15. The Indian Lake girls team finished second. Team scores were Ada 80.75, Indian Lake 68.25, and USV 5. 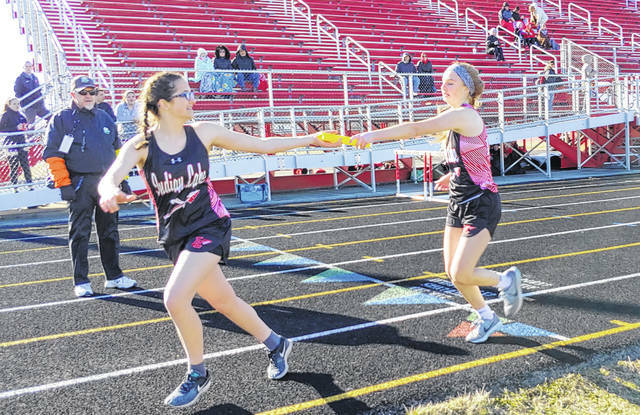 Ella Wagner passes the baton to Rachel Wahl in the 4×800 relay.